Will it clean your pipes? 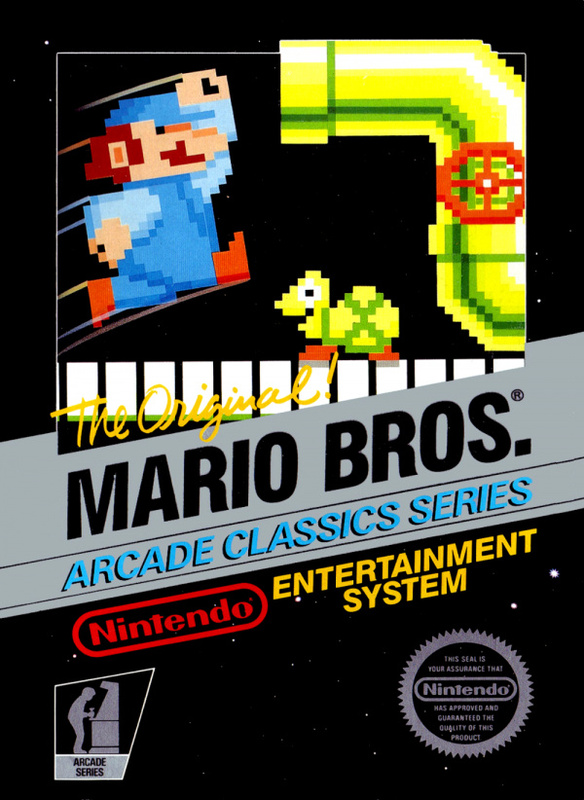 When Mario Bros. hit arcades in 1983, most Nintendo fans were expecting yet another Donkey Kong release and weren't quite prepared for the spin-off Nintendo served up. Now it was Mario and his brother Luigi who were at war with a constant flow of pests coming though their sewer pipes. The game was yet another hit with arcade gamers and eventually made its appearance on NES in what remains one of the most faithful arcade ports of the game available. But how exactly does this classic NES release stand up on the Virtual Console service all these years later? 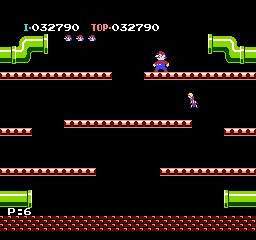 Much like pretty much every other arcade release of the early 80s, the gameplay premise behind Mario Bros. is quite simple. 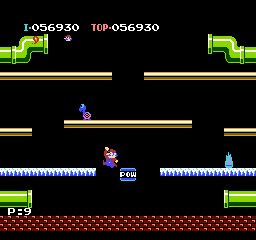 You take control of one of the Mario brothers and your goal is to rid each level of the pests that keep coming out of the sewage pipes. In order to take them out. you must first jump up and hit the ledge they're standing on from below. This temporarily stuns them, giving you the opportunity to run up and kick them off into the water below before they can regain their footing. Of course different pests require different techniques. Some, like the sidesteppers, are only stunned after two hits, whereas others, such as the Fighterflies, require you to hit the ledge they're on while they're touching it. To further complicate matters, there are a barrage of fireballs flying around trying to take you out as well. The gameplay is as smooth as you'd expect from a Nintendo title, but the action can get quite hectic as you progress through the game. If you want to make things a bit more interesting you can play the game in two player co-op mode and either help each other out or compete against each other for survival and points. While the single player game is fun enough, the full experience is in the co-operative mode. The visuals are simple, but given the hardware capabilities of the time period, this should come as no surprise. 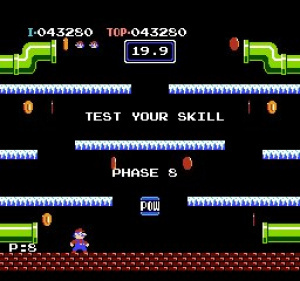 The game is a fairly accurate representation of the arcade release, but some graphical corners were still cut when it came to overall detail. The same can be said of the music as its still plenty recognizable, but doesn't have quite the flair of the arcade version. It's no secret that the original Mario Bros. game is beginning to look a bit dated, but it's difficult to ignore the fun factor of the game. As a single player experience it might prove to be a bit too redundant for anyone other than diehard fans of the original, but if you can round up a second player, you're likely to get far more out of the experience. It might not be the mega hit that Donkey Kong was, but it's still a great game and one worth checking out for fans of the early arcade games. This is a great game for co-op, but not much else. This game should go on the VC Arcade. My friends and I played the arcade version for hours and to say it won't hold your attention is not true. The increase in difficulty is perfect and a lot of fun. It would be nice to see Mario Bros the arcade version and also Donkey Kong the arcade version. Nintendo should make this happen especially since it's Mario's 25th Anniversary. Fans would download the games to get a chance to play the original that started it all. Nintendo please make this happen! This is a fantastic game! Easily one of the most addictive games I have ever played. It was well worth my $5.00/500 points. My current high score is at 301,403. Beat that! I have the Mario Advance versions, i think i keep that versions to play it. When I first try this game a long time ago, it was one of my least played games.